I offer up an exotic Indian twist on this traditional holiday gift-able sweet. 1. Line the cookie tray with parchment paper. 2. Put the chocolate in the mixing bowl. 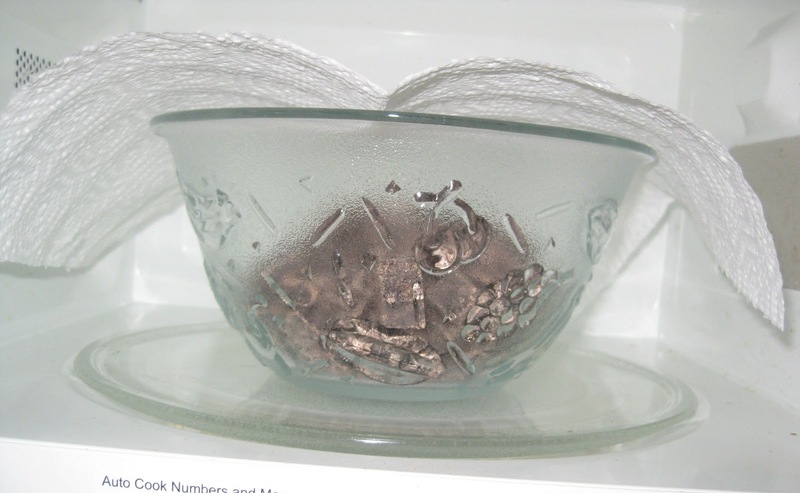 Cover the bowl with a paper towel. Microwave on high power for two minutes. 3. 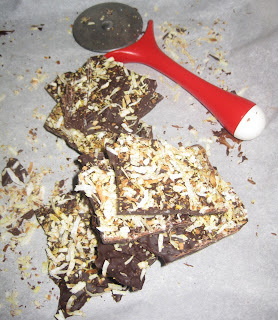 While the chocolate is melting, pour the coconut into the skillet in a thin even layer. 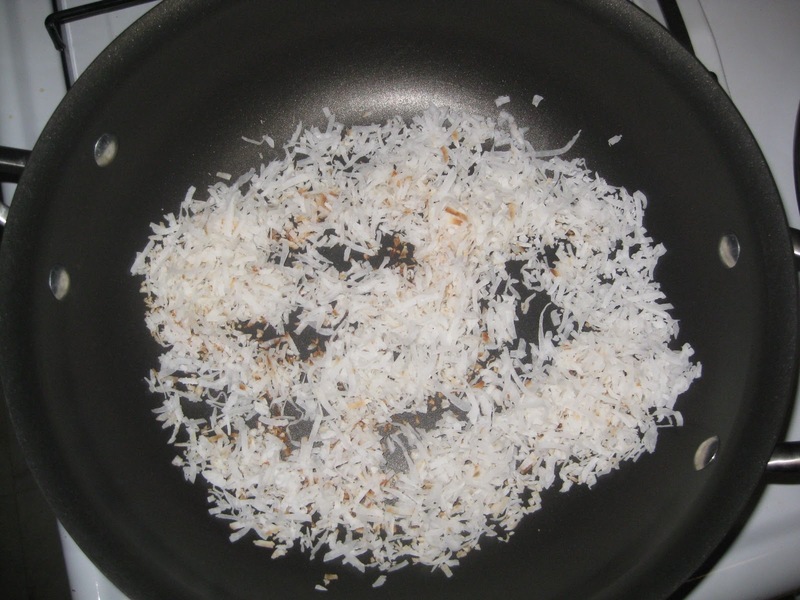 On low heat, toast the coconut, stirring frequently. 4. When the microwave beeps after two minutes, stir the chocolate, then re-cover and put back in the microwave for another two minutes on high. 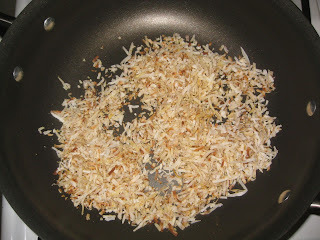 Continue stirring the coconut. 5. When the microwave beeps, stir the chocolate again, then re-cover and put back in the microwave for another minute (or until completely melted). 6. Now that the coconut has been toasting for about four and a half minutes, add a 1/2 tsp. of the curry powder and a 1/2 tsp. of ground cinnamon to the skillet. Stir frequently for 30 seconds, then turn off the heat and remove the skillet from the burner. 7. Add the remaining 1 tsp. curry powder and 1/2 tsp. 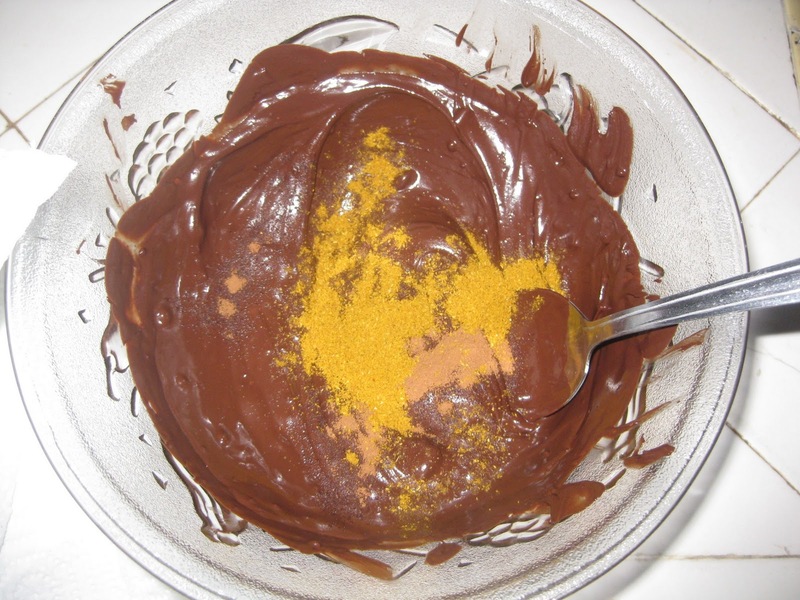 cinnamon to the melted chocolate. Stir through. 8. 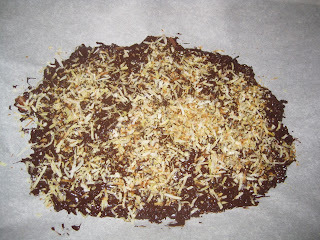 Add about 3/4 of the coconut mixture from the skillet into the mixing bowl with the chocolate. Fold in. 9. 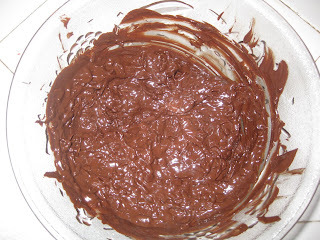 Spread the mixture thinly onto the parchment paper. 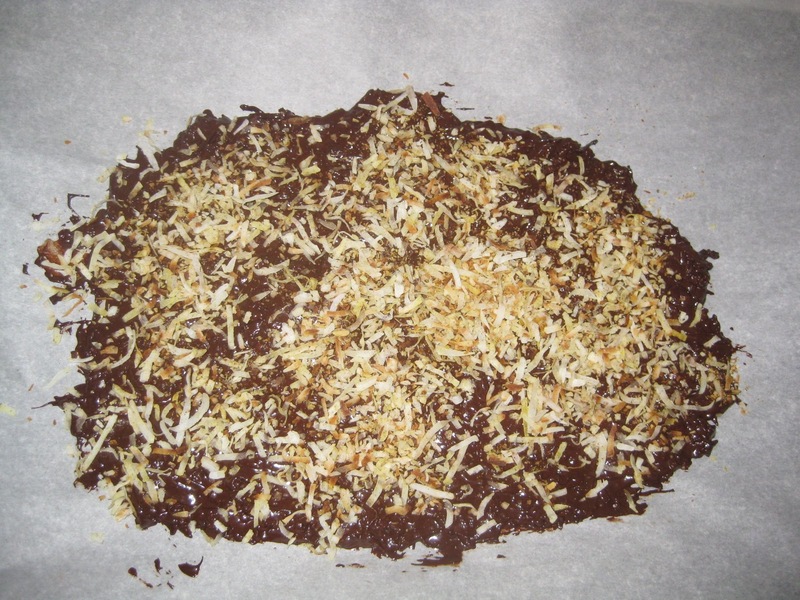 Pour the remaining coconut-spice mixture on top of the bark. Refrigerate for about an hour. 10. Use a pizza cutter to break into pieces. The AHH Factor: When it comes to making traditional Indian food, let's face the facts. You don't want me making it for you. Or, at least, you don't want me making it for you, then trying to pass it off as authentic, when the truth is I substituted multiple ingredients for ingredients that were "easier to find" or "healthier" or "that I could pronounce." But fusion cuisine, now that I can do. 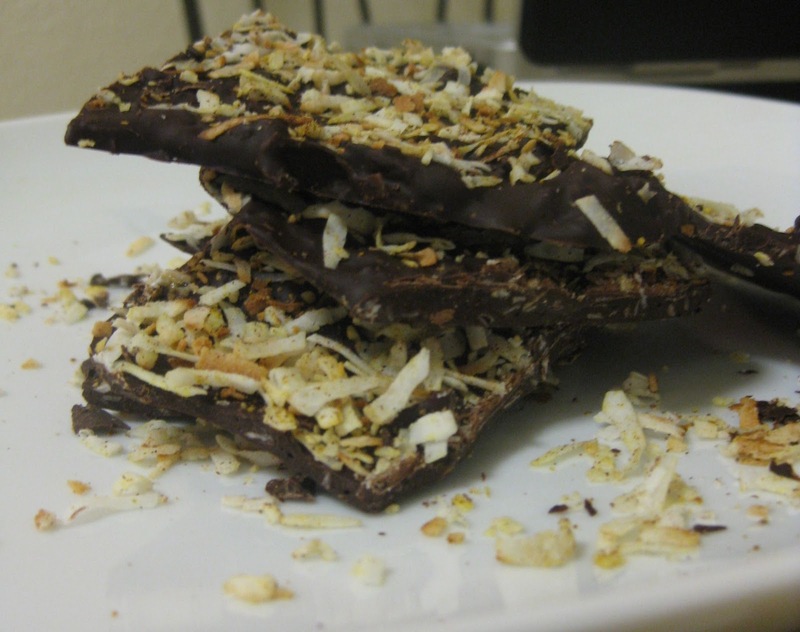 So, with the holidays swiftly approaching, I developed this recipe as an exotic version of the American holiday favorite: chocolate bark. A few years ago, I made a white chocolate bark with broken candy cane pieces and gave it out as a casual Christmas gift. I got great feedback on this gift. This year, I had friends taste-test this bark. Actually, I put them on the spot and asked them to guess the secret ingredient. (OK, so it's not a secret for you since you've read the recipe already, but I wanted them to say "curry powder.") I heard a range of guesses that were all in the correct range -- cumin, turmeric, and coriander, to name a few. I also got comments it was clear there was a "warm taste in the background," "a distinctive aftertaste," and that it should be "inhaled, and not just tasted on the tongue." I know -- my friends sound a lot more sophisticated than I do! Later, Nick, who already knew what the secret ingredient was, surprisingly liked this bark too. I say surprisingly because Nick doesn't generally like dark chocolate. He's more of a sweeter milk chocolate guy, but I think it was the coconut that won him over. 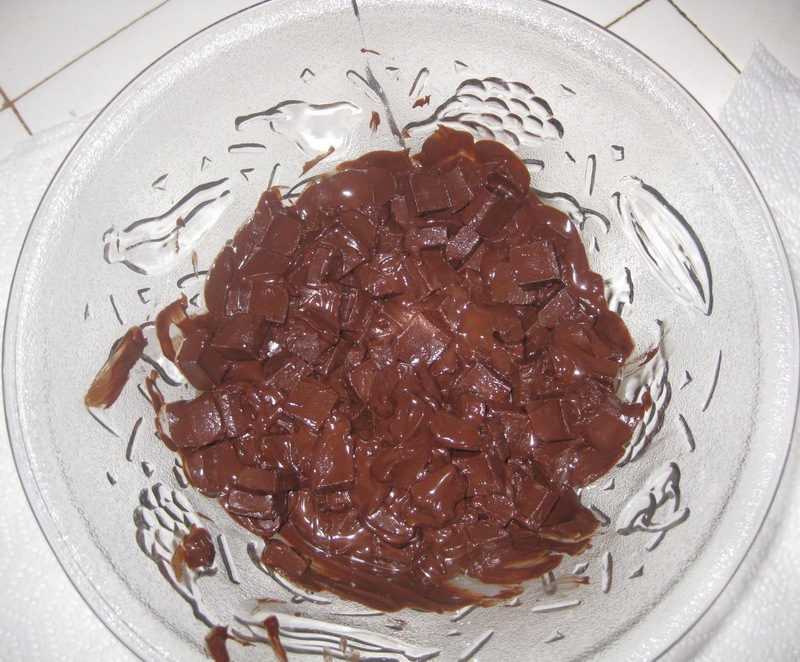 Oh, and yes, I know that chocolate is better melted using the double boiler method, and it was also suggested to me (quite correctly, actually, I will also acknowledge) that instead of using a ready-made curry powder mix, I would be better off selectively picking the individual spices in the correct proportions, maybe even grinding them myself. And, I would even make my own suggestion that it's more fun to break the bark into pieces by slamming the pan on the counter, rather than quietly slicing with a pizza cutter. But, again, let's face the facts: I didn't have the time to pull the bark out of the refrigerator until 1 a.m. (And I'd be willing to bet I'm not the only one with this no-spare-time predicament.) So, I say -- in the spirit of Thanksgiving -- let's all be thankful for pre-made mixes and microwaves! As you know, I really liked it. I think if I ever made it, I would put some chili flakes in it. Thanks, guys! Exotic-flavored chocolates are the best! The Choxie brand at Target has some surprisingly good ones. And Nicole: Chili flakes are a great idea. I love curry powder but I've never thought to combine it with chocolate! This is a fabulous idea, and a fantastic gift. Thanks for the idea! And yes, I have a weakness for Choxie. And everything else that Target has to offer. Produce a program to access the particular fantastic aim. Sportsmen program their particular exercise instances to produce their particular chanel replica handbags to be able to very large ranges. To obtain an increased diploma, section of the program could be to research distance education plans in order to perform when you keep on the schooling. Understand whichever realized expertise you should arrive at the aim, for instance using lessons to be able to chanel replica bags an individual to get a increased place and maybe participating any tutor or perhaps coach’s aid. Give attention to just how fantastic it's going to sense to own the metaphorical rare metal medal about the throat once you start to be able to sense dejected. It is possible to guess each patient provides wished to give up at once or perhaps one more. You'll find nothing sadder if you ask me as compared to chanel replica bags any runner decrease prior to the conclusion of your contest, as opposed to setting up in which added energy just like certainly one of our own feminine invariably winners on the Greater london Olympics would. In the last 100 toes roughly, the lady got their start in powering and also jetted before the girl previous opponent to be able to wander chanel replica handbags with all the rare metal medal! Difficult to get your own personal finest with whatever you decide to take into account being the fantastic aim will be to be sure and also to chisel out there no less than a few hours a week to be able to loosen up, invest some time together with folks an individual chanel replica bags, and also whatever else an individual benefit inside living, which means that your large hope doesn’t become a living unbalancing attraction.